Sir Roger Twysden (1597–1672) was an English pamphleteer and constitutional historian, who, over a long career, was not only deemed ‘troublesome, [and] unreliable’ by King Charles I, but later, in 1642, imprisoned for anti-parliamentary activities. It is no wonder he decamped to the countryside, where he wrote An Historical Vindication of the Church of England in Point of Schism (1657), a narrative positing an early British priority for the English Church over Rome. 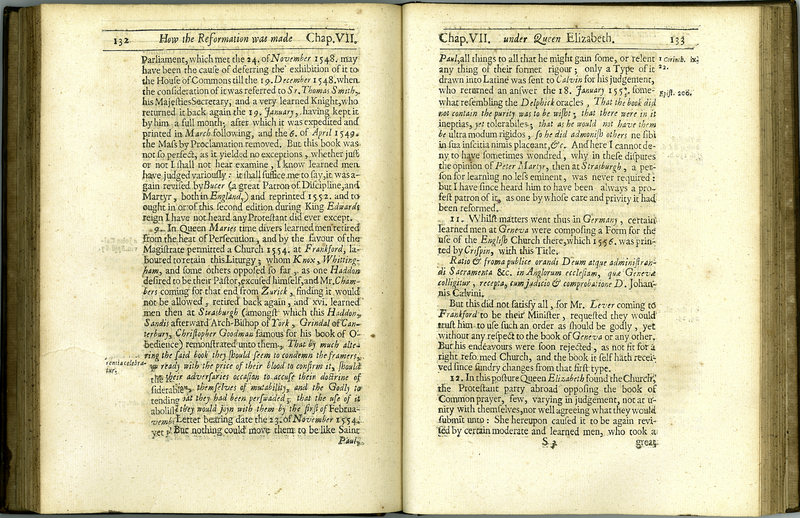 In this second edition, he notes the persecution of Protestants in Queen Mary’s time, and Geneva, where John Calvin was active. Twysden was an admirer of Paolo Sarpi, the anti-papalist; he may also have had sympathies with Huldrych Zwingli (1484-1531), the leader of the Reformation in Switzerland. Sir Roger Twysden, “An Historical Vindication of the Church of England in Point of Schism,” ourheritage.ac.nz | OUR Heritage, accessed April 24, 2019, http://ourheritage.ac.nz/items/show/10378.